Home | Is Your Body in Toxic Overload? We are all in toxic over load. Toxins are in the food, you eat, the water you drink, and the air you breathe. You are probably aware of most environmental toxins: pesticides, heavy metals, chemicals, pollution, caffeine, and preservatives. But what you may not realize is how our bodies produce natural toxins, such as ammonia and carbon dioxide, which linger in the body if they can not be broken down. 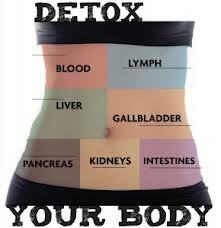 The liver, lymphatic system, kidneys, lungs, intestines, blood and skin filter these toxins. When over loaded your body becomes inefficient and toxins can build up. If these toxins aren’t eliminated, then your well-being can be compromised. If you answered “yes” to any of the questions above then you would likely benefit from my weight loss purification program. Learn more on my facebook events page.